Disclaimer upfront: I am in no way affiliated with or employed by Cervelo. Cervelo uses very strong colours in their marketing material and I didn’t want to change that. The black with bright red and white is very recognizable as the “Cervelo colours” in the peloton. A material Cervelo uses a lot is carbon. I wanted to use that texture as well in the main design, so the overall background of the site has a carbon texture. I wanted to use a big header image on all pages, to really show-off Cervelo’s amazing bike design. By taking a small part of a larger image of a bike you’ll get a sort of abstract feel to the image, which was exactly what I was looking for. The navigation on the old site was very confusing, so one of the first things I changed was the main navigation. A big navigation bar with strong colours and relatively big type. 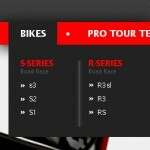 I incorporated a big dropdown to get easy access to all of Cervelo’s bikes. Also, through a carousel on the homepage it is very easy to get to all the bikes right from the homepage. The bike detail pages were very long and cluttered with information. To streamline these pages, I opted for a short introduction about the bike, grouped together with a small image gallery. The rest of the information can be accessed through a tabs-system at the bottom of the page.